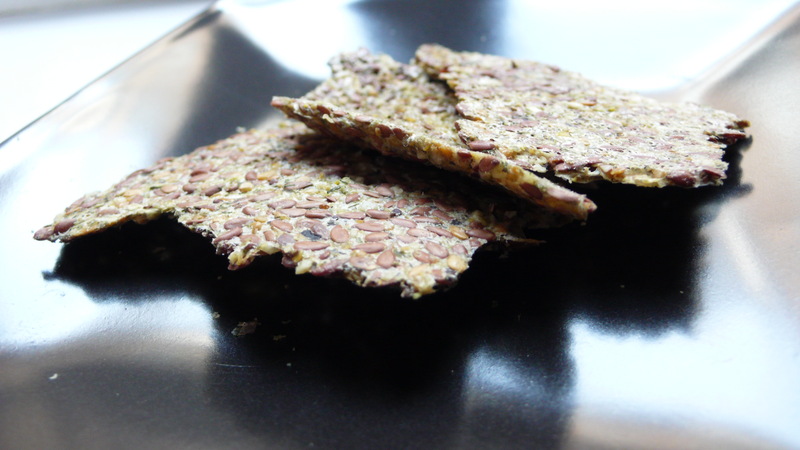 Today’s recipe is the raw food classic, Flax Crackers. Flax seeds are great because they contain high levels of lignans and Omega-3 fatty acids. Lignans are said to benefit the heart, possess anti-cancer properties and all kinds of good stuff. Flax oil and flax seeds are being rediscovered as true health foods. They definitely merit being included on any top-ten list of foods that are good for you. Flax is not a new food. It is actually one of the older and, perhaps, one of the original “health foods,” treasured because of its healing properties throughout the Roman empire. Flax was one of the original “medicines” used by Hippocrates. Flax could be dubbed the “forgotten oil.” It has fallen out of favor because oil manufacturers have found nutritious oils to be less profitable. The very nutrients that give flax its nutritional benefits – essential fatty acids – also give it a short shelf life, making it more expensive to produce, transport, and store. […] Because of the flurry of scientific studies validating the health benefits of omega 3 fatty acids, flax oil has graduated from the refrigerator of “health food nuts” to a status of scientific respectability. You can get flax seeds at any of the health food stores here in France. Here is the most basic flax cracker recipe from which you can get creative: experiment by blending whatever veggies and herbs you like with the water before soaking, or by adding other seeds and nuts. You can’t go wrong. I love stirring in raw sauerkraut, garlic, dill and mustard for example. Or, try stirring in agave or maple syrup with cinnamon and finely minced apple for a kid-pleasing sweet cracker. Mix all ingredients and let soak for three hours. Now you’ll have a gooey mix perfect for spreading on two dehydrator Teflex sheets. Score the sheets. Dehydrate at 115ºF for 8 hours or overnight. Flip onto mesh screens and dehydrate 2 – 3 hours more, until completely dry. Break into pieces and they are ready for dipping in hummus, salsa, guacamole, etc. or just snacking on as is! Excalibur is a brand of dehydrator very popular with Raw Foodists. I got mine for use in France directly from Excalibur in the US. For an oven-made version of flax crackers, check out my friend Deana Gunn’s recipe. Deana is an excellent cook and author of the cookbook “Cooking with All Things Trader Joe’s.” Her blog is great and features some vegan recipes! Continue reading for further health facts from Dr. Sears. Flax seeds are rich in soluble fiber. The combination of the oil and the fiber makes flaxseeds an ideal laxative. Flax seeds contain over a hundred times more of a phytonutrient, known as lignin, than any of its closest competitors, such as wheat bran, buckwheat, rye, millet, oats, and soybeans. Lignins have received a lot of attention lately because of possible anti-cancer properties, especially in relation to breast and colon cancer. Lignins seem to flush excess estrogen out of the body, thereby reducing the incidence of estrogen-linked cancers, such as breast cancer. Besides anti-tumor properties, lignins also seem to have antibacterial, antifungal, and antiviral properties. My wife and I recently had flaxseed crackers at a vegan-ish restaurant and I was looking for a plain recipe for use with our ancient Excalibur dehydrator. So glad I found this one! I’ll give it a whirl! Thank you!